Raisins, prunes, dates, there are always lots of open bags in my kitchen shelves. Sometimes it’s just too much! 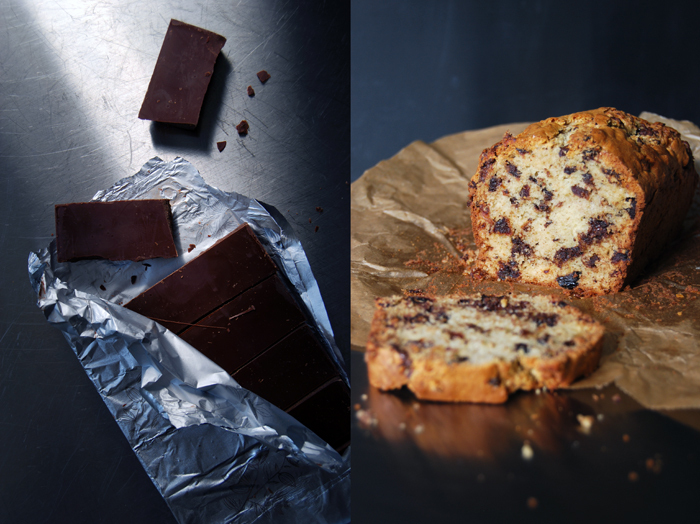 When there’s no corner left which isn’t occupied by dried fruits I know it’s time for a recipe to empty them at one go and a fruit loaf is one of them. My fruity mixtures change depending on my shelf finds, I’ve often stocked up on figs, apricots or cranberries a bit too excessivly during the winter months as well, they can all go into the cake to add their concentrated fruity sweetness. It works for morning loaf cakes as much as for muffins, it makes them rich and won’t leave you hungry! I’m particularly fond of this in combination with bittersweet chocolate, big chunks that melt into the dough and merge with the fruit, delicious! 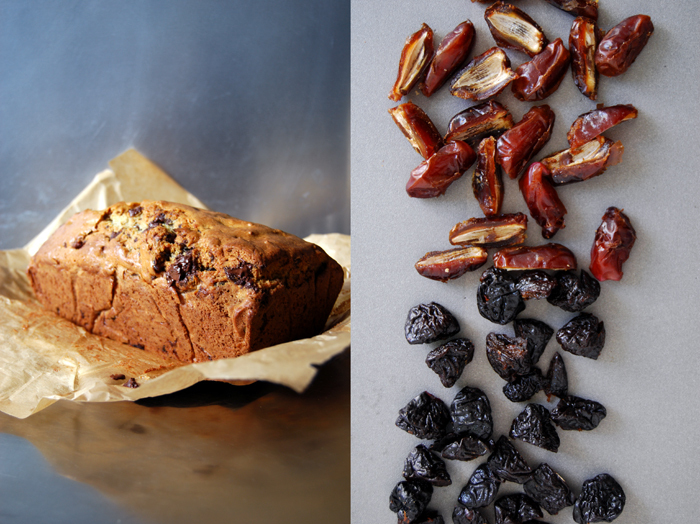 This time I had dates, prunes and a dark Belgian chocolate which ended up in the lumpy dough, roughly chopped and sticky. 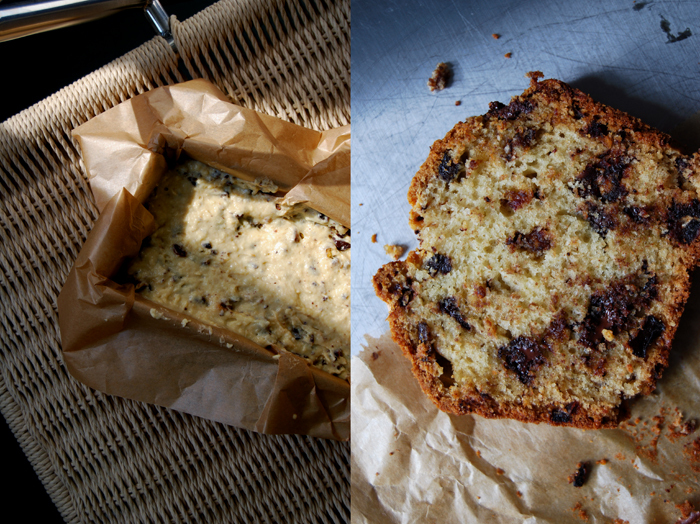 It made the loaf dense and moist and so pleasantly sweet that it felt like a sweet bread rather than a cake. You can replace the dried fruit with any other you find in your shelves and add some nuts or white chocolate. 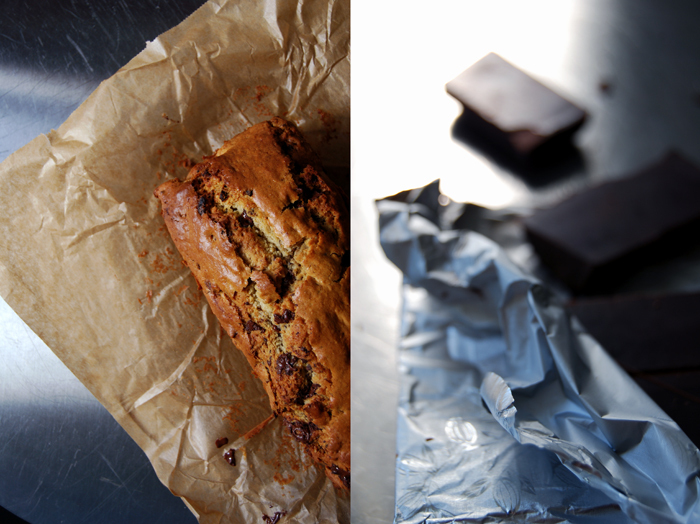 I often bake it on Sundays when I feel the urge to bake all of a sudden, I can be sure that I will find something in my shelves worth turning into a fruit loaf. Set the oven to 190°C / 375°F (fan-assisted oven). Line a loaf pan with parchment paper. Combine the dry ingredients. Whisk the butter, milk and eggs and mix in the dry mixture with a wooden spoon. Don’t over mix, the dough should be lumpy. Gently stir in the dried fruit and chocolate and scrape into the pan. Bake for 30 minutes, turn the oven down to 175°C / 350°F and bake for another 15 minutes or until golden. Check with a skewer, it should come out clean. Let the loaf cool in the pan for a few minutes before you take it out. This looks so appealing and delicious! I have open bags of those very same items in my pantry.